Three DP70 (___+____+____). 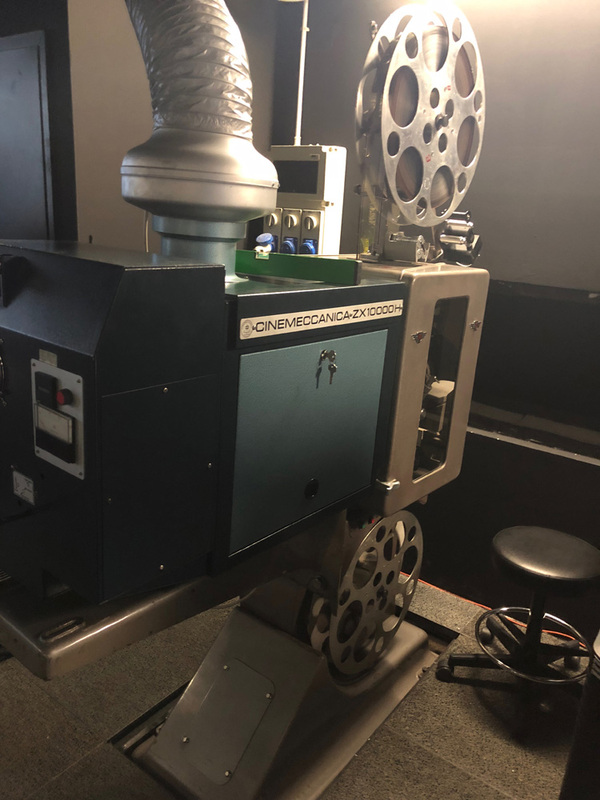 There were quite a few installations of DP70 in Israel, I've seen 3 DP70's in Cinema Sharon in Nethania back in 1980, naturally they showed only 35mm. 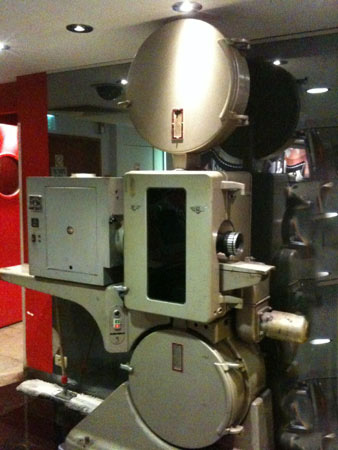 There are 3@ Fedi 70 machines still in the booth of cinema Gordon in Tel-Aviv. Both cinemas have been defunct for years. Alex Asp, 13.06.2011. The machine is not functional. With 70 mm empty reel in upper magazine, and 35 mm reel in the lower. The film gate inside is 35 mm, and the magnetic heads block is still in place. 18.06.2011 image by Steven Becker. 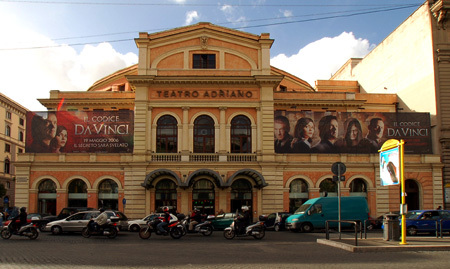 First permanent Todd-AO theatre in Europe. "Oklahoma!" opened here 14.02.1957 (European premiere). Original cinema rebuilt 1990 into a multiplex and equipped with Kinoton machines. 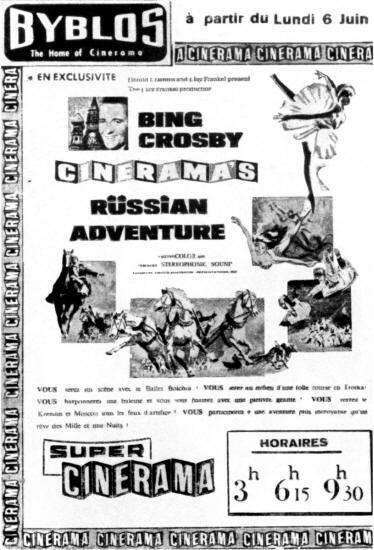 From the Super Cinerama days (70mm) of the Cinema Byblos, an advert for "Cinerama's Russian Adventure", around 1967. Advert from George Florence's' collection. 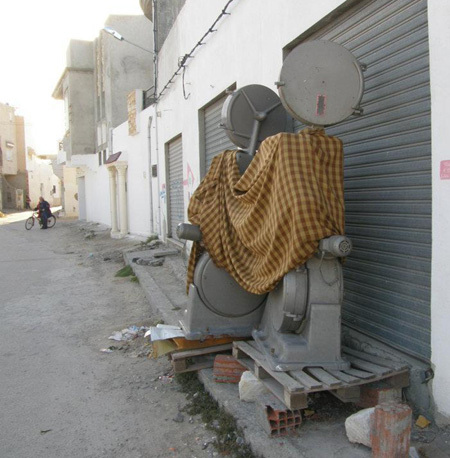 A pair of DP70s on their way to the scrap dealer in a back street, somewhere in Beiruit. Opened 09.11.1936, 2219 seats. Renamed ABC 1963. Two DP70 installed 25.12.1959 and "South Pacific" shown in Todd-AO. DP70 moved 1969 to private in Glasgow, Scotland. Closed 22.09.1977 by arson. Renamed Cannon. (Reopened date?) Closed 01.07.1993. Two DP70 (1761+1762). Opened in 1966. 1152 seats. Also two FP7 projectors. The first 70mm film, "Circus World", were without subtitles. 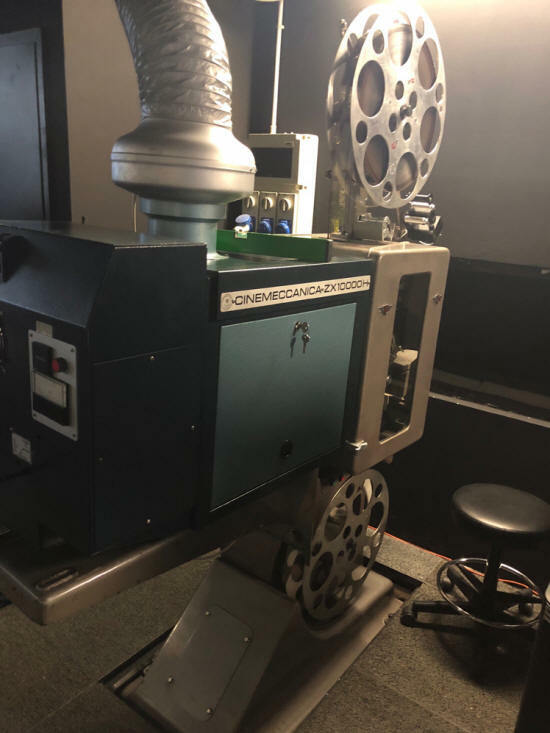 Subtitles were projected in 35mm. Cinema is closed and used as car parking. Projectors are still there. July 2009: "Studio-ul n-a avut niciodata 70mm. Au fost numai la Patria si Luceafarul." 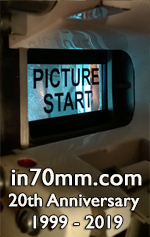 / Cinema Studio never had 70mm. 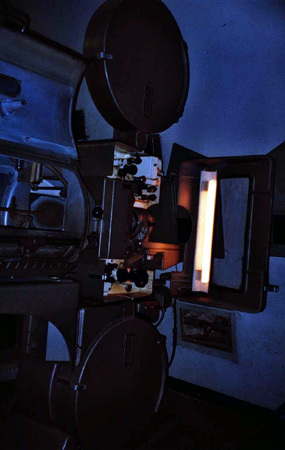 Cinema Patria and Luceafarul have had 70mm projectors. Built in 1914. 927 seats. Closed in 1993. Moscow Cine and Concert Hall "Cosmos"